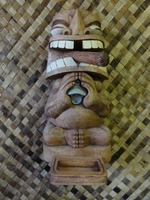 THIS TIKI BOTTLE OPENER IS HAND CRAFTED, HAND CARVED, AND HAND PAINTED, THIS EXOTIC WORK OF ART IS APPROXIMATELY 20" TALL x 10" WIDE X 10" DEPTH. HAS A BOTTLE OPENER WITH A DROP TRAY FOR THE BOTTLE CAPS AND ALSO HAS A CIGAR IN ITS MOUTH. THESE DECORATIVE BOTTLE OPENERS ARE CARVED FROM A SOLID PIECE OF TREE TRUNK. OURS ARE ALREADY SEALED FOR OUTSIDE USE, NOT LIKE OTHERS THAT SELL TIKI MASK.